Choose small local cuttlefish. If we want we can keep the ink and cook them with it. Here they are cooked without it. Clean the cuttlefish and leave them whole to drain. Chop the onions and half of the tomatoes. Put the other half in a blender with the two carrots. Cut almost 500gr from a cabbage in medium pieces. Slightly sauté in the olive oil the onions and add the chopped tomatoes . Almost immediately pour the rest of the mashed tomatoes with the carrots. As soon as comes to boil throw the cuttlefish in. Add the cabbage, salt and pepper and let them simmer. f it tastes sour add 1-2 teaspoons sugar. When the food is almost ready turn up the fire and add ouzo. Let them boil for a while until the alcohol is vaporized and then its ready. 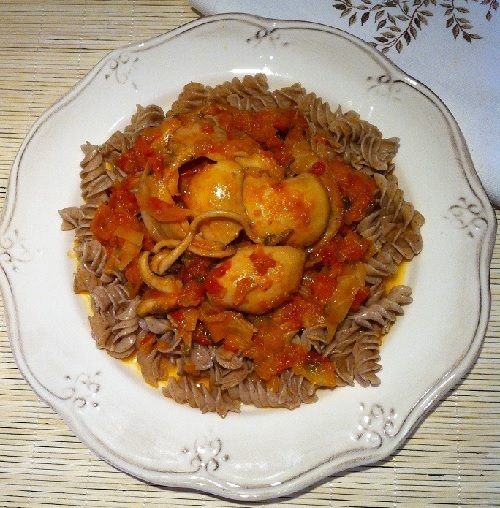 Boil the Cretan pasta maggiri whole wheat and serve. We chose to accompany our sea food with maggiri homemade pasta, but you can combine them with rice, boiled or fried potatoes. You can also cook it with more cabbage and serve it plain. *Choose the ingredients carefully the fresher they are, the tastier the food.